Concurrent assertions are based on clock semantics and are evaluated continuously with every clock edge. Concurrent assertions can be temporal that means usually it describes a certain behavior that spans over a time interval. The evaluation model for concurrent assertion is based on clock and the evaluation happens only at the occurrence of a clock tick. The values of variables used in the evaluation are the sampled values. This way, a predictable result can be obtained from the evaluation, regardless of the simulator’s internal mechanism of ordering events and evaluating events. The concurrent assertions are executed in the observe region. The actions that are to be executed upon success/failure of an assertion are not executed immediately, but in the reactive region. Controlling concurrent assertion is possible from outside by using system tasks like $asserton, $assertoff, and $assertkill. An example of concurrent assertion is shown below. Concurrent assertions can be reset or disabled. Also it can be labelled and this label can be used in reports (”%m”) as shown above. Concurrent assertions in sequential environment are also possible. They contain temporal behavior but embedded in a sequential environment and derive their activation from the simulation execution of the surrounding code. They contain sequential behavior and work on sampled values. For concurrent assertions it is important to ensure that the defined clock behavior is glitch free. Otherwise, wrong values can be sampled. Also, if a variable that appears in the expression for clock also appears in an expression with an assertion, the values of the two usages of the variable can be different. The current value of the variable is used in the clock expression, while the sampled value of the variable is used within the assertion. 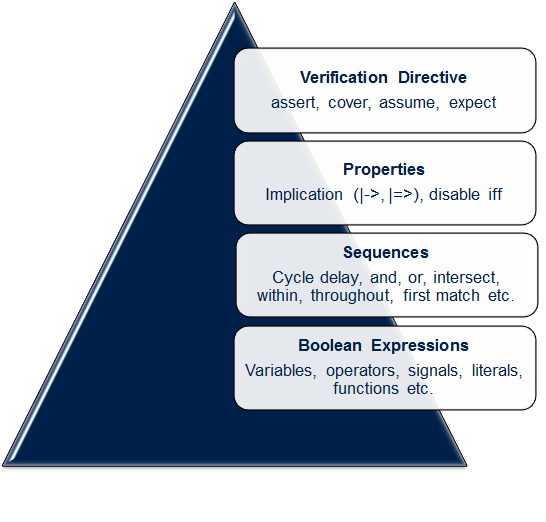 Boolean expressions, sequences, properties and verification directives are the building blocks for concurrent assertions. The lowest level of hierarchy is the Boolean layer. In this layer, Boolean expressions are used to make basic blocks for assertion. Boolean expression does not consume time. Immediate assertions use only Boolean expressions, but concurrent use Boolean with temporal expressions. Boolean Expressions are allowed to include function calls, but certain semantic restrictions exist. That means, functions that appear in expressions which does not have output or ref arguments (const ref are allowed). Assignment operators (e.g., +=, -=) and increment/decrement operators (++/–) are not allowed inside SVA. In the Sequences layer, these Boolean expressions are concatenated to each other over a period of time. This will be elaborated in the Sequence section. In this layer, complex sequential expressions or Boolean expressions are used to define certain expected behaviour of the design. For more details, please refer property section. This layer decides on the action that the verification tool has to perform for a certain property is specified. Properties and sequences – clubbed. 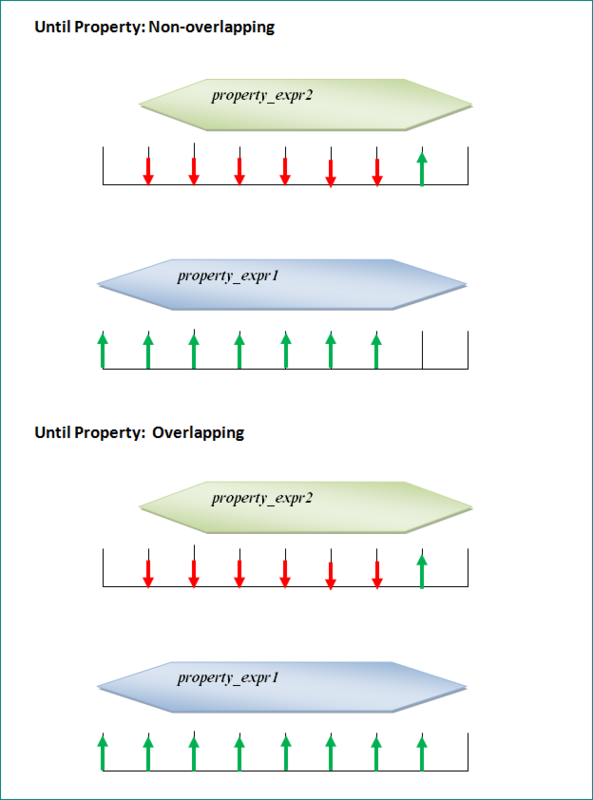 Properties,Sequences and Verification directives – Separated. Sampling mechanism in concurrent assertions eliminates possible races between RTL and assertions. It delays evaluation up to one clock cycle. The definition of a sampled value of an expression is based on the definition of a sampled value of a variable. The variable and the corresponding sampled value can be found the below picture. The timing model employed in a concurrent assertion specification is based on clock ticks and uses a generalized notion of clock cycles. The definition of a clock is explicitly specified by the user and can vary from one expression to another. A clock shall tick only once at any simulation time and the sampled values for that simulation time are used for evaluation of concurrent assertions. The clock that is used to trigger the assertion need not be a real clock of the DUT and can also be a reference clock from TB. But it must be glitch-free. In addition, the triggering clock does not have to be a clock and an assertion can be triggered by any event. In the clocking expression of an assertion the current value of the clock is used and not the sampled one. Can you please tell when the signals inside a disable condition is sampled? Is it preponed ? When is disable condition evaluated? Observed?